Mr. President, Make It Rain Candy! 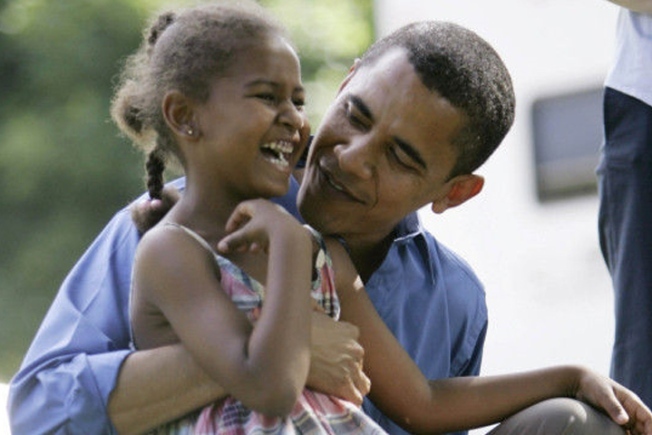 A new e-book reveals what kids Malia's age want from President Barack Obama's tenure in the White House. NEW YORK — End war, forever. Make the planet greener. Please help my dad find work. Make it rain candy! Thousands of kids detailed their hopes and expectations for President Barack Obama in letters and drawings as part of a worldwide project, with 150 chosen for a free e-book being released on Presidents Day. Most had tall orders for the new guy in the White House. Anthony Pape, 10, of Du Bois, Pa., offered: "I hope that we will have no war ever again. I mean why are we fighting why can't we all be friends." "I would appreciate it if you would try to make this a greener planet and try to bring home the troops and end the war," the fifth-grader wrote. "I am very luckey because I am not part of a military family, but it saddens me to hear about all the people who die in Iraque and know that somewhere In the world people are greiving over a lost family member." Seven-year-old Aaron Van Blerkom's letter was simpler — but no less problematic. "Dear Mr. Obama," the Pasadena, Calif., first-grader began, "Please Make it rain candy!" The "Dear Mr. President" project was a joint effort between the National Education Association and kidthing.com, which is putting out the book for use with its downloadable media player. A special hardcopy edition of the book will be sent to the White House for Obama, who has done wonders to bring the office of the presidency to life for young people. The letters were written in January amid Obama-mania at inauguration time as schools scrambled to bus kids to special viewing events and come up with computer screens and TVs for them to watch in classrooms and auditoriums. Kids ages 5-12 were eligible to participate. Submissions flooded kidthing, including some from other nations. Lawrence Hitchcock, chief executive officer of the Web site, said more than 4,500 letters were considered for the book on a heart-wrenching range of topics that don't stop at an end to the war and climate change. "We had, 'My dad's out of work, fix the company, please get more jobs,' Hitchcock said. "There were Latino kids saying, 'Please change the immigration laws so my dad can come back from Mexico.' This is a profound snapshot of a social narrative of young kids during an important moment in history. It really kind of stunned us what came in through the front door." Another of the winners, 12-year-old Destiny McLaurin, a sixth-grader from Medford, N.Y., had friendship on her mind. "I hope Mr. Barack Obama will one day create a holiday for children from around the world" she wrote. In interviews, some of the letter-writers remained optimistic that "Yes We Can" was more than just a campaign slogan. "I feel very proud because I know he'll be able to make a change in the country and we'll be a lot more happier," Destiny said. "I think he should make people feel more welcome, people who don't really get along with other people." "Make fires and earthquakes not exist. Make no tornadoes or any of those things that break things." An 11-year-old boy from Ohio drew himself in tears at the side of a relative. His dream, he wrote, is that a "cure for cancer will be found" with Obama in the White House, "Because it took my aunt to a better place on father's day." Another child drew Obama as the "new sunrise of America." One made Earth and labeled it "Obamaland," and still another created the president's face as half dark and half light skin tones with the words: "United We Are One." Sasha's drawing is an all-green globe. Her enthusiasm for Obama and his ability to get the job done speaks volumes: "I just think he's really, really awesome."